The rivers, hatches, flies, and strategies to improve your stonefly game. Two summers ago I received a phone call from my fishing partner. It was the first week of June, and according to my buddy, Salmonflies (Pteronarcys californica) were hatching on the Colorado River near Parshall. That phone call was a call to arms. It meant we had to drop everything and head straight to the river. Not tomorrow or the next day—right now. Seasoned anglers know that stonefly hatches are feast or famine. Timing is everything. Hit the hatch perfectly, and you think you’re the consummate angler. Miss it, and it’s one of the biggest disappointments of the year. Stonefly hatches provide some of the best opportunities to find large trout feeding voraciously on aquatic insects. In the case of Salmonflies, Golden Stones, and Skwalas, the insects are also large, tempting trout to the surface or shoreline areas to prey on nymphs. Stoneflies are of the order Plecoptera, which means folded wings. (“Pleco” means folded and “ptera” means wings.) The order Plecoptera, commonly called stoneflies, has an incredible diversity of species—nearly 600 in North America alone. It’s easy to underestimate their importance because, as the common name implies, stonefly nymphs mostly hide among rocks on the stream bottom. Most stonefly species thrive in similar habitats. They have specialized gill structures that limit their living quarters to cold, unpolluted, highly oxygenated trout streams. On most Western drainages, it’s rare to flip over a rock or log and not find a stonefly or two crawling under it. A fast-water seine sample also demonstrates their prolific nature. Stoneflies pass through an incomplete metamorphosis. Unlike caddis and midges, they do not have a pupal stage in their life cycle. The durations between their life phases—egg, nymph, and adult—depend on the species and on water temperatures. Smaller species, such as Early Winter Stoneflies, Yellow Sallies, and Skwalas, typically have a one-year lifespan. Larger species, such as Golden Stoneflies and Salmonflies, generally live from three to four years. As a result of the multiyear life cycles of the larger stonefly species, several different year classes live in the stream at any given time, and stonefly nymphs remain plentiful year-round, even after the adults have emerged. Since the trout see and eat nymphs all year, Western anglers should be prepared to fish them at all times—not just near peak hatch periods. Don’t rule out fishing stonefly nymphs in January, basing your decision simply on the time of year, or because you don’t see any. Throughout the winter months, tumbling ice chunks frequently dislodge stonefly nymphs from the substrate, creating a feeding frenzy. Stonefly nymphs have forked tails, segmented abdomens, branched gills, three sturdy pairs of double-clawed legs, pronounced wing pads, prominent eyes, and slender antennae. During emergence, stoneflies migrate toward the river’s edge and crawl from the water onto streamside rocks, willows, grass, and trees to hatch into adults. You’ll see evidence of this process in the form of their empty exoskeletons clinging to bridge abutments and boulders along the river. Because the hatch occurs on land, stonefly nymphs transitioning to adults (“emergers”) are not available to trout during the emerging process. But the heavy concentration of nymphs along the streambanks during the migrating process increases their availability at certain times of the year. Nymphing along the river’s edge is highly productive during these migration periods. Not surprisingly, adult stoneflies look similar to the nymphs, with the exception of the two pairs of veined, folded wings—two forewings and two hind wings—over their backs. Unlike mayflies and caddisflies, stoneflies do not produce mating swarms or spinner falls. Instead, they mate on land. Male and female stoneflies locate one another by drumming or tapping their abdomens on branches, tree trunks, and rocks. The male initiates one rhythmic pattern, which is subsequently answered by a female. Each species has its own unique drumming pattern. Adult stoneflies consume fluid foods, and as a result sometimes live between one and three weeks before they find a mate. After they mate successfully, females fly over the water and drag their abdomens on the surface to deposit their eggs, but other than that, stoneflies rarely fly. They crawl to find and meet their mates. The good news is that stoneflies are clumsy. They are easily dislodged by wind, and once airborne, they are poor fliers. They often end up in the water, where they flutter, creep, and clamber toward the shore, or drift aimlessly. If they aren’t eaten, they often drown and are washed downstream to be eaten submerged, as nymphs would. Early Winter StoneflyEarly Winter Stoneflies (Nemouridae, Capniidae, and Leuctridae families) are small black stoneflies (6-8mm) that emerge from January through March. They thrive in small streams with abundant coarse rubble and are often seen crawling on top of the snow along the river’s edge. Winter stones rarely produce dry-fly fishing, but a sparse black Pheasant Tail (#16-18) fished in the soft holding spots along the shore is often effective in late winter and early spring. Skwala stoneflies (Skwala species) inhabit waters across the Rockies, from Alberta south through Colorado, as well as in Washington, Oregon, California, and Idaho. colored on the bottom. Pat’s Rubber Legs (olive/brown), #8-10 Mercer’s Skwala Stones, and #8-10 Halfbacks are recommended nymph patterns. The adults hatch from the last week of February through late April, typically peaking between the last week of March and the third week of April. Adult Skwalas are about the same length as the nymphs, with olive to dark brown bodies and mottled orange highlights around the legs and underbellies. Stranahan’s Bitterroot Olive Stoneflies, olive Foamulators, and pearl Crystal Stimulators (#8-10) make good adult imitations. Salmonfly hatches are famous for providing some of the best dry-fly fishing of the summer, with the hatch on most rivers progressing slightly upriver each day. Good timing is critical for success. During heavy emergences, the streambanks are littered with egg-laying adults and eager trout lined along the banks waiting for them. Things can go wrong though, including inclement weather, spring runoff, and erratic flows. You may arrive too early—before the hatch really gets going—or you may get there slightly too late and find the trout are crammed full of adults and they’ll decline your offering no matter how good your fly looks or how many fluttering adults are present. Though this rarely happens with hatches of mayflies or smaller stoneflies, during Salmonfly hatches trout do get full and slow their feeding. In this case, try moving several miles upstream or ahead of the hatch, where the trout are hungrier. If you are early and the hatch isn’t happening yet, try dead-drifting nymphs along the shoreline where the naturals are gathered prior to emergence. Effective nymph imitations include #6-10 Kaufmann’s Stones, Halfbacks, Dorsey’s Paper Tigers, Creek Nymphs, and Pat’s Rubber Legs (brown/black). My favorite drys include #4-8 Sofa Pillows, Rogue Foam Stoneflies, Fluttering Stoneflies, orange Stimulators, and orange oamulators. Golden Stoneflies (Perlidae family) begin hatching about two weeks later than Salmonflies in most watersheds, emerging between early July and mid-August. This means that on many rivers, adult Salmonflies and Golden Stones crawl the streambanks together for a period of time. However, Golden Stones are the most abundant of all large stonefly species in the West, and the hatch duration is much longer. On some waters, Golden Stones hatch for up to 30 days, or more. Golden Stones thrive in both unregulated freestone streams and in tailwaters below deep bottom-release dams, so they are more common on more waters than the bigger Salmonflies. Salmonflies rarely thrive in overly fertile tailwater fisheries or in spring creeks. Golden Stoneflies are roughly the same size as Skwalas (17-23 mm). The nymphs are a speckled yellow brown, and the adults range in color from a rich golden brown to dark brown, with lighter tones around the legs and on the underbelly. They could be easily confused with Skwalas if it weren’t for hatch timing. Skwalas are early spring stoneflies, while Golden Stones are summer species, most prevalent in the month following the Fourth of July. Golden Stonefly nymphs are important foods for trout on most Western watersheds through the entire year. In the weeks preceding the hatch, focus your efforts on the fast, rocky holding water near the banks. Barr’s Tungstones, Barr’s Tung Teasers, Pat’s Rubber Legs (brown/orange), Beadhead Hare’s-ear Nymphs, and Mercer’s Golden Biot Stones (#8-10) are a few of my favorite Golden Stonefly nymph imitations. The best dry-fly fishing occurs in the afternoon, when the adults come back to the water to deposit their eggs. The trout key on these egg-laying flights, and anglers can generally catch fish on the surface throughout the course of the day. Yellow and olive Stimulators, Rogue Foam Stoneflies (golden), and Amy’s Ants (olive) in #8-10 are excellent imposters. The most prolific stonefly on Western waters—and possibly the most overlooked—is the Yellow Sally or Little Yellow Stonefly (Isoperla species). Many anglers don’t recognize this hatch when it is occurring right before their eyes, or don’t carry flies to imitate nymphs and adults in the correct places and seasons. Yellow Sally nymphs are a mottled light brown or tan color (7-18mm). The adults are substantially lighter colored, from pale yellow to fluorescent yellow or even lime green. Yellow Sallies thrive in tailwaters, spring creeks, and freestone streams. My home waters in Colorado—the South Platte, Blue, Colorado, Gunnison, Arkansas, and Roaring Fork rivers, to name only a few—have excellent Yellow Sally hatches. Colorado guides know that Yellow Sallies provide some of the most dependable stonefly fishing of the year. A nymph imitation such as a #12-14 Oliver Edwards Yellow Sally is my go-to fly between late June and the end of July. I typically add a #18 Beadhead Pheasant Tail, #16-18 Barr Emerger, or #12-14 Hare’s Ear to my nymph rig to imitate the Pale Morning Dun and Green Drake mayflies that generally hatch at the same time. Splashy rises along the streambanks often signal fish eating Yellow Sallies, and if I spot a fish lying in a feeding position along the bank, I show it a yellow Stimulator or Headlight Sally (#12-14) as a first choice. It’s difficult to make generalizations about tackle for all stonefly fishing, since Salmonflies require heavy, weighted nymphs and large wind-resistant flies, while Yellow Sallies are more delicate. To cover all these situations—and to meet the demands of large Western rivers and frequently windy conditions—use 9-foot, 4- to 6-weight, fast-action rods. When fishing smaller stoneflies (#10-14), I typically use a 4-weight rod, but when I need to lob a heavily weighted Kaufmann’s Stone nymph or punch a Rogue Stone dry into a stiff breeze, I use a 6-weight. My basic stonefly nymph rig is a 9-foot leader terminating in 2X to 5X tippet, depending on fly size. Use the thickest tippet you can get away with—trout are not typically leader-shy with stonefly imitations. Water clarity is also a consideration—use finer tippets in clear water and fluorocarbon tippets and leaders for nymphing. For drys, use 9-foot monofilament leaders, tapering to 3X or 4X, depending on the wind and water conditions and the size of the fly. Longer leaders are normally not required because, especially in fast water, trout either jump on stoneflies or they don’t. And with large flies, a long leader can be difficult to turn over. The most productive method of fishing stonefly nymphs is on the dead-drift with a conventional two-fly rig. Carry both weighted and unweighted nymphs to fish a wide array of structure transitional zones such as midchannel shelves to deeper slots and highly oxygenated pocketwater. The unweighted nymphs fish best in shallow riffles and near the banks. Stonefly time often coincides with higher flows in the spring, and runoff can cause water clarity issues. 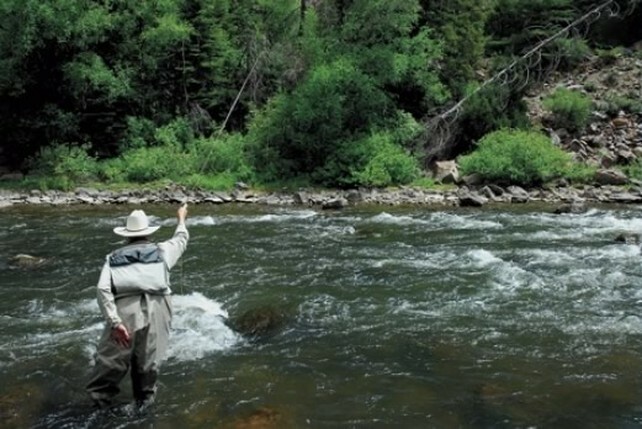 Under these conditions, wading anglers should use a straight upstream delivery along the bank. Carefully managing the fly line under your index finger is the best tactic. Strip the fly line as it floats back downstream to alleviate any drag that might arise due to poor line control. The upstream delivery also reduces the chances of spooking trout sitting in shallow riffles. In theory, trout can’t see you because you’re casting from their blind spot. The edges of the stream are the first places to clear during spring spates and, in search of big bites, opportunistic trout often occupy these areas. The food outweighs the risk, and they position themselves in just enough water to cover their backs. Work the bankside water carefully and thoroughly, then take a step or two upstream and repeat the process. In short, don’t ignore skinny water you think is too shallow. Twelve to 18 inches deep is plenty for a trout feeding on stoneflies. Fishing adult stonefly imitations is one of the most rewarding experiences in fly fishing. Trout feeding voraciously on adults sometimes create splashy rises. At other times, trout in slower water slurp stoneflies slowly and confidently as if they were feeding on drifting mayfly duns. This usually occurs when stoneflies are drifting helplessly on the surface of the river, as opposed to fluttering females depositing eggs. It’s not uncommon to see caddis, mayflies, and craneflies hatching at the same time as stoneflies, which can further complicate things with regard to fly selection. Careful observation of the naturals should help resolve any doubt about what trout are actually feeding on. Sometimes trout feeding on mayfly duns can’t resist the appearance of an easy, large stonefly meal. Don’t be afraid to experiment. If you see a fish rising, cast to it (of course), but adult stonefly imitations are also excellent for covering likely water. Fish methodically, showing your fly to as many trout as possible, and if stoneflies are around, you will find willing eaters. Pay close attention to darker areas in the substrate where trout like to hide, and focus on bankside water with logs, canyon walls, and partially submerged boulders where stoneflies may fall into the water. Both dead-drifted and skated presentations are effective with stonefly drys, but try to twitch your pattern rather than skating it smoothly through an entire swing. This produces a lifelike fluttering behavior common in egg-laying females and often triggers explosive takes. With large drys, don’t set the hook too soon. Allow the trout to eat your fly and dip below the surface before you set. If you can still see your fly, it’s too early to set the hook. As the high-water season recedes, many previously hard-to-reach spots become accessible for targeting opportunistic trout. This post-runoff period is perfect for dry/dropper fishing with two stonefly imitations, or a stonefly dry indicator and a mayfly nymph dropper. One of my favorite rigs is a #8-10 Amy’s Ant dry with a #18-20 Mercer’s Tungsten Micro May or a #12-14 Oliver Edwards Yellow Sally nymph. In effect, your dry becomes your strike indicator, suspending one or two nymphs below it. During a time when discriminating trout become suspicious of standard two-fly nymphing rigs in deeper water, use the dry/dropper rig to cover a wide assortment of water, including transition zones that funnel into deep pools, riffles, runs, pocketwater, bankwater, and protruding logs. This rig is especially productive in skinny water that rarely gets fished with conventional nymph rigs. Big FishWhile stonefly hatches are not as prolific as mayfly and caddis hatches, they provide some of the best big-fish opportunities of the year. Timing may require several visits to each watershed, but once you hit the hatch right, you’ll never forget the experience.